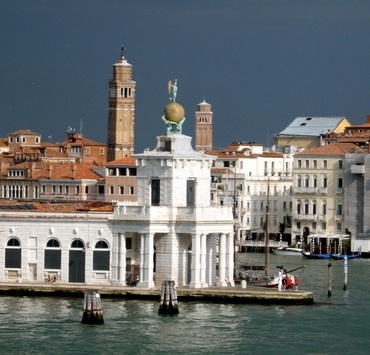 The triangular-shaped Punta della Dogana separates the Grand Canal and the Giudecca Canal. Locally known as the Punta del Sale ('Salt Point') for its former salt warehouses, its landmark is the customs house topped with a bright golden ball supported by two Atlases, and topped with a circus acrobat figure of Fortune, who serves as a weathervane with her pointer and rudder; a charming conceit though it’s hard not to notice that all three figures are sectioned like cuts of meats in a butcher’s diagram. Venice's first customs house was by the Arsenale, but beginning in 1414, all goods brought into Venice by sea were unloaded here and assessed for customs duty. The current building dates from the 1670s. Today, along with Palazzo Grassi, it's a centre for contemporary art, with exhibitions of works from the Pinault Collection.